Our commitment to sustainability is an investment in our collective future. It means meeting our present needs while preserving the planet for those who come after us. Our goal: A brighter future for our customers, our suppliers, our employees, and our neighbors. Edge trimmings from our plastic film carriers are pelletised and recycled using our thermal energy pipeline. Bulk material spools are retrieved from customers for winding and distributing new orders. We were the first in our industry to remove solvents from coating processes and the first to substantially reduce the use of heavy metals. Recycled non-contact cooling water cools down the dye equipment. Heat from dye process wastewater is recovered by heat exchangers and used to pre-heat incoming water. Outgoing water is clean, cold, and compliant with all environmental standards. Efficient thermal management processes keep our nylon fibers at optimum temperature and moisture conditions no matter what the weather. We regularly partner with consultants, customers, suppliers, and neighbours to rethink how we can positively affect our environment – and then put those ideas into motion. 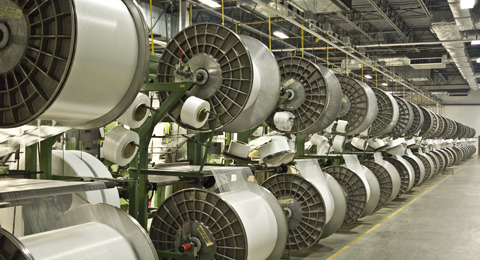 Velcro Industries is ISO 14001 certified for our environmental management system (EMS). Since 2003, we have met or exceeded our annual goals while managing more than 1,300 environmental initiatives. We have reduced our overall environmental impact by 15% while simultaneously expanding our manufacturing capacity. By expanding our EMS, we are able to minimise our impact on our natural environment, control costs, and produce higher-quality products with greater efficiency.